It’s the age-old question – well, more of just an old question, because anyone with a basic belief in science and/or has been on a plane knows otherwise, but – ‘Is the Earth flat?’ still buzzes on in the minds of sceptics across the (FLAT!) world. However, despite recent logic deficient arguments, one picture might have just put all the theories to bed once and for all. 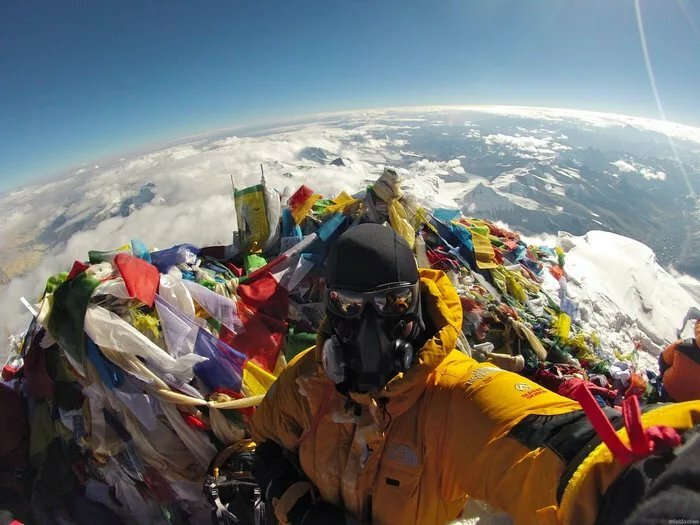 In a Reddit post simply captioned: ‘Checkmate flat Earth society’ user amazed_spirit shared an image of him or someone they know posing for a selfie atop Mount Everest with the – you guessed it – curved edge of the planet in the backdrop. Everest, in case you skived every day of school, is the highest mountain above sea level, located in the Mahalangur Himal sub-range of the Himalayas on the border between China and Nepal. Its elevation rises to 8,848 metres, or 29,029 ft. Forget about dumb curvature arguments. The fact that you can only see 2.5% at a time proves it isn’t flat. If it was flat you should be able to see the whole thing from even just the top of the tallest mountain or on any commercial flat. Though one user brought into question whether the photographer was using a fisheye lens and thus distorting the image. There was no appearance from ardent flat-earther Connor Murphy who recently disclosed why we don’t fall off the edge of the planet.